Unmanned Aircraft Systems (UAS) – known as “drones” – have come a long way from being fun toys for hobbyists. The technology is gaining acceptance on the commercial side, especially in the commercial real estate industry. 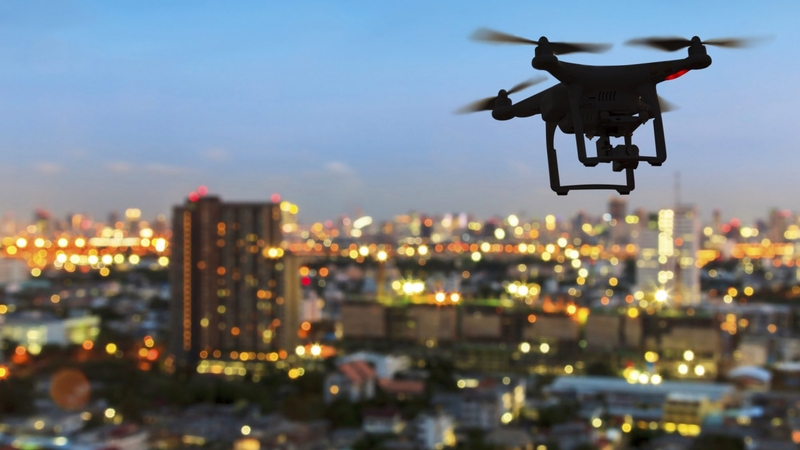 Brokers rely on UAS photographs to boost their marketing efforts, while general contractors fly them around construction sites to check for safety issues and scheduling. But what, exactly, are drones? In the United States, the Federal Aviation Administration (FAA) classifies a UAS, or Unmanned Aerial Vehicle (UAV) as it’s sometimes known, as a small, unmanned aircraft weighing less than 55 pounds, that typically operates via radio frequency. Armed with powerful video and/or photographic attributes, these small, flying objects do everything from collect data, to delivering goods. And Amazon Inc. and Google Inc. are experimenting with these vehicles as part of their “last-mile” delivery chains. Amazon’s Prime Air and Google’s Project Wing are hoping UAS technology will be the ideal tool to deliver items into areas, within a narrow time window, in an attempt to bridge that last mile between warehouse and consumer. But a closer look reveals that there is still some ways to go before drones can take the place of delivery trucks. Companies producing and distributing consumer goods have been under continuous pressure to ensure up-to-date supply chain efficiencies. Basically, the quicker goods can get to end users, the happier end users will be. A recent report issued by CBRE on “Last Mile/City Logistics” noted that e-commerce is challenging traditional supply chains, while millennials are driving the “need-it-now” culture that drives same-day and overnight deliveries. To that end, Amazon Prime Air wants to “safely get packages to customers in 30 minutes or less, using unmanned aerial vehicles . . .” according to its website. Prime Air is currently testing the technology throughout the United States, as well as in the UK, Australia and Israel. There is, however, no specific date as to when the service will be ready for delivery. “We will deploy when and where we have the regulatory support needed to safely realize our vision,” the website said. Meanwhile, Google’s Project Wing, which runs under the auspices of Google’s Alphabet, is less drone and more literal wing. The program strives to develop (small) aircraft that “deliver everything from consumer goods to emergency medicine – a new commerce system that opens up universal access to the sky,” according to its website. Project Wing had some success in 2014 in Queensland, Australia, during which it delivered a first-aid kit, candy bars, dog treats and water to farmers. And, in summer 2016, the company announced plans to launch Project Wing’s delivery service in 2017, but not much more has been forthcoming. A recent report issued by McKinsey & Co. pointed out that drones are proving to be “surprisingly cost-competitive in rural areas.” However, the McKinsey analysts were careful to point out that this was in rural areas, rather than denser urban areas. And the analysts also noted that the UAS vehicles require larger landing areas, an impossibility for urban areas. Flexport Inc. is even less impressed, noting that the success of last-mile delivery is determined by route density and drop size. The company said drones are not effective with either aspect, as the current UAS prototypes can carry only one package at a time, before returning to home base to recharge and/or collect another delivery. There is no doubt that drones, overall, have their uses. But last-mile delivery, at this juncture, isn’t one of them. Unless and until Amazon, Google or another company solves issues surrounding UAS delivery usage, the idea of drones dropping off books or other objects at our doorsteps will remain a dream.